Looking for info on cheap paintball in Minnesota? Paintball is a sport in which a group of players compete and use a paintball gun and try to eliminate the other players by shooting them with paintballs. Paintball games are an inexpensive and fun activity for all ages. Here at Action Packed we offer many different rental packages that are affordable, we also offer walk-on-plays, and birthday parties. Paintball is an activity that is enjoyable for every age. You can’t go wrong with cheap paintball games. They are thrilling and fun. You can bring a group to play, and there is even a walk-on-play available for smaller groups who want to play with other people. 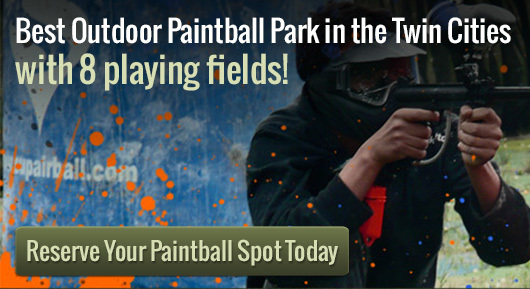 They also have reservations and private paintball games available for parties and more. And the staff are very friendly and easy to get along with. There are 8 different fields to choose from, and you can choose the one at your own convenience. These fields are set up to where many can play in one group. Each field has a different unique theme such as: city of tombstone, firebase alpha, speedball, civil war, the jungle, badlandz, and woodsball fields. Each field is unique and set up for fun. You can choose whichever one you prefer. Cheap paintball games are an easy and affordable way to have fun. To get reservations you can contact us at 952-492-6776. Reservations can be made 7 days a week from dawn until dusk. Again you can make reservations for birthday parties and special events. If you are looking for some fun, cheap paintball at Action Packed is a great choice for a group of people.